Hudson might have made a name for itself with Bomberman and Bonk games, but the Japanese developer has hit a breakthrough with Wii title Lost in Shadow. The Wii doesn't get enough credit. Third party Wii games don't get enough credit. (Blame years of shovelware for that!) But Hudson has tapped the graphic limitations and the controller potential with Lost in Shadow. During my short play through on the E3 show floor, I found myself immediately enchanted with the game's shadow-based platforming. It is at its heart, a traditional platformer, but with a twist. Players control the shadow of a young boy as he runs along the shadows of objects in the foreground. Instead of following those objects in the foreground, players need to focus on the shadows they cast. It's an interesting concept that gives the game an out of body experience. That is, it seems, the point. A fairy accompanies you through the level and can be used to find points to unlock puzzles to continue through the level. There are "memories" to collect that have been left behind by others. Collecting these memories will cause your shadow to gain grams of weight, which increases the health bar. In one of the stages I was played through, my shadow wielded a sword and was chased about by a shadow monster with multiple arms. The gameplay itself was simple and straightforward, employing both the Wii Remote and the Nunchuk. 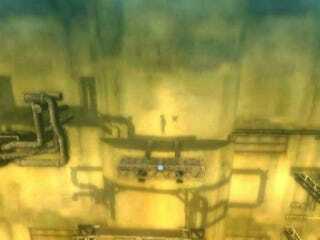 To unlock puzzles, players guide the fairy using the Wii Remote and pulling the B trigger button to find glowing points. Lost in Shadow is a seemingly simple game — and that's not a "seemingly simple" in a pejorative sense. It does appear to hint at a deeper experience, which is something that booth hands-on can't truly do justice to. I can see myself getting lost in Lost in Shadow. It is one of the best titles I have played at this year's E3.